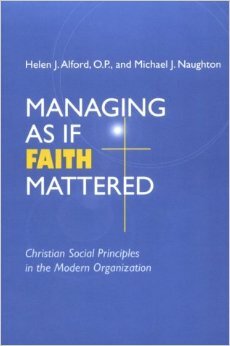 “Managing as if Faith Mattered” is the first volume in the Catholic Social Tradition Series, published by the University of Notre Dame Press in response to Pope John Paul II questioning how many Christians really know and put into practice the principles of the Catholic Church’s social doctrine. Its target audience is thus, first and foremost, Catholics in business, although the authors say that they are directing their book towards Christians as a whole and that its content will be worth considering by all people (page xvii). 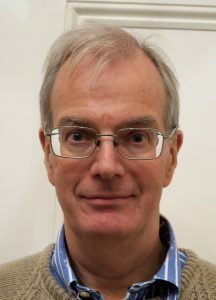 At the time the book was published, in 2001, Helen Alford was Dean of the Faculty of Social Sciences at the Pontifical University of St Thomas Aquinas in Rome and Michael Naughton was Director of the John A. Ryan Institute for Catholic Social Thought at the University of St Thomas, St Paul, Minnesota. Unsurprisingly, they adopt a precise analytical approach to their subject and, as the 73 pages of end notes illustrate, seek academic rigour. None-the-less, the two questions that they pose in order to frame their discussion are profoundly practical: “What kind of person should I as a manager or employee strive to become?” and “What kind of organisational community should I as a manager or employee strive to build and maintain?” (page 8). They suggest that two unhelpful paradigms foster a divided life in present day Western culture: first, the paradigm of the “secularisers” (typified by Tom Peters, co-author of “In Search of Excellence”), who suggest that religion and spirituality have nothing to say to business since religion is by its nature a private affair; secondly, the paradigm of the “spiritualisers” (typified by Andrew Carnegie), who may have strong personal faith and seek to live out this faith in personal virtue but who “avoid judging business policies in light of their faith” and who “fail to be true to a faith that does justice” (page 15). Alford and Naughton, asserting the relevance of faith to business, take issue with both paradigms, before analysing three models of linking faith and work: what they call the “natural law approach” (which seeks to find common ground in order to mould secular organisations); the faith-based approach (which is manifested by organisations founded explicitly on faith inspired values); and the prophetic model (which seeks to challenge organisations). They recognise weaknesses in all of these models but urge that they all be kept in mind. Alford and Naughton then address the purpose of business. They severely criticise the suggestion that this is merely to make money or, indeed, merely to enhance shareholder value; they draw attention to the limitations of a stakeholder model of organisational purpose; and they conclude that the purpose of business is “working together for the common good” (the title of Chapter 2), defining “the common good” as “the promotion of all the goods necessary for integral human development in the organisation, in a way that respects the proper ordering of those goods” (page 70). This definition then leads naturally into the consideration of the concept of human development in a corporate community and, at the core of this, is a discussion of “virtue” and, in particular, the four Catholic Cardinal Virtues. The book then moves from the theoretical to the practical in four chapters that are collectively entitled “Making the Engagement”. These consider, in turn, job design, just wages, ownership and marketing and, whilst continuing to analyse and develop theoretical concepts, seek to consider practical solutions to business problems. Thus, for example, the discussion of pay suggests that three basic tests need to be applied: whether something is a living wage; whether it is an equitable wage; and whether it is a sustainable wage (page 130). This theory is then applied to remuneration concepts such as ESOPs (Employee Share Option Plans). Finally, the book turns to spirituality at work, considering the use of prayer, scripture, daily reflection and, perhaps more surprisingly, liturgy. All of this provides much food for thought. The critique of modern professional education for its failure to address the “ends of business” (page 16) and its recommendation by default of a “privatised professional ethic” (page 18) is particularly telling and its fresh look at the objectives of job design and remuneration is challenging. Unfortunately, however, the book is heavy going in places and some of it could have been more simply expressed. For example, the book would have been more accessible to its lay readers had the authors expressed more pithily their points relating to the distinctions between “foundational goods” and “excellent goods” (page 42) and between “common goods” and “particular goods” (page 49). Similarly, the discussion of virtue would have been more accessible to modern businessmen had the authors not felt it necessary to tie it back to Aquinas’s teaching. More generally, there is a grave danger that the key points made by the authors become lost in a sea of detailed analysis. It is also disappointing that, for all the care in the analysis, unsupported contentious statements from time to time leap off the page. For example, the quotation (with apparent approval) of Peter Maurin’s statement that “when everyone tries to become better off, nobody is better off” (page 92) suggests a naïve “zero sum gain” view of global economics and the quotation (again with apparent approval) of the assertion that “a manager’s first obligation is maintaining the company as a going concern for the benefit of the stakeholders” (page 149) seems contrary even to the purpose of business as contemplated by the authors. Furthermore, many Christians will raise eyebrows at various theological statements such as the statements that we are meant “through virtuous living to attain the possession of God” (page 64) and the quotation of Pierre Teilhard de Chardin’s statement that “God is inexhaustibly attainable in the totality of our action” (page 207). Those who are not used to Catholic academic analysis may also find the frequent quotation of Thomas Aquinas, Pope John Paul II and other Catholic authorities a distraction rather than a help and the authors’ use of the terms “Christian Social Tradition” and “Christian Social Teaching” to refer to what is specifically Catholic teaching is irritating even though, as the authors point out, in recent years there has been some ecumenical convergence in relation to social teaching (page 247). This book is worth reading but it requires time, determination and a degree of patience.